Bedroom Progress: 55% done, 45% to go! 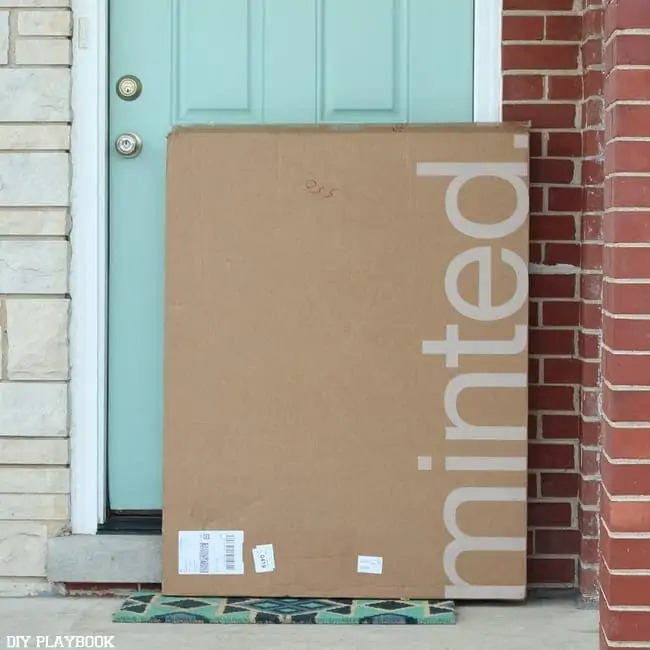 Disclaimer: We have partnered with Minted to bring you this post. All opinions are our own and are not influenced by Minted. Thank you for supporting the brands that help support this blog! The bedroom “refresh” continues, and like I mentioned Monday, at a much faster pace than I anticipated. As much as I wasn’t expecting such a fast turnaround (and quite honestly am a little overwhelmed with the pace) I’m super excited to make these changes and even more excited to get some of the “dirty work” done before I started helping Casey on her guest bedroom makeover last weekend. 1. Remove the old Gallery Wall: This was a tad bittersweet for me. Our gallery wall was literally one of the first things we hung in our house 3 years ago and was a springboard for a lot of the decorating decisions we made after that. I’ve outgrown the nautical inspiration a tad, but still loved the meaning, color, and general stories behind each of the pieces we chose to include…especially the DIY Pallet sign. Chestnut meets Mayfield are our street names growing up and such an important ode to our families and houses before this house. We will definitely be incorporating this pallet sign somewhere (maybe the patio?) but aren’t sure where just yet. 2. 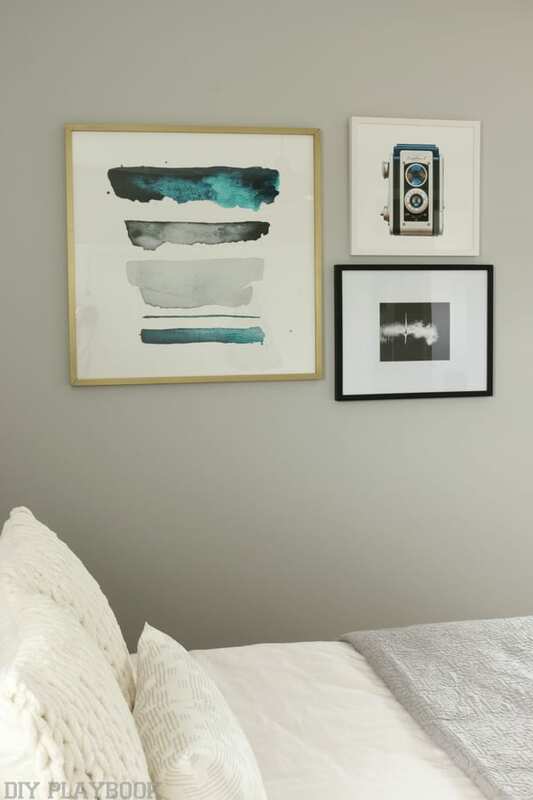 Pick out a new paint color: It’s not like we didn’t like the paint color in our bedroom before, however, I’ve been gravitating toward more grays these days and wanted to include this in our makeover. 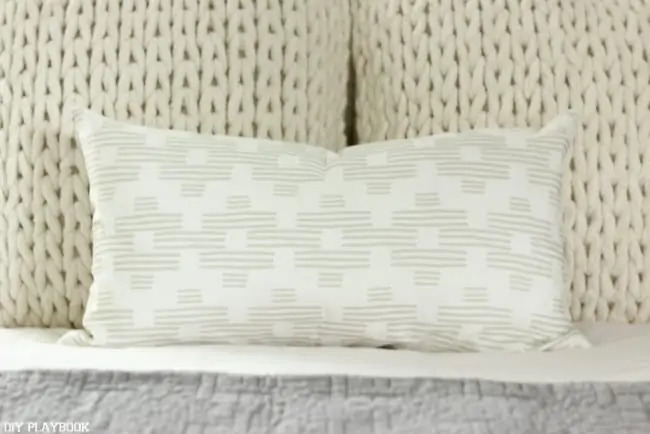 I knew I wanted a very light gray because our room is so bright and I really love that, especially in the morning when we drink coffee in bed on the weekends (our absolute favorite time of the week). 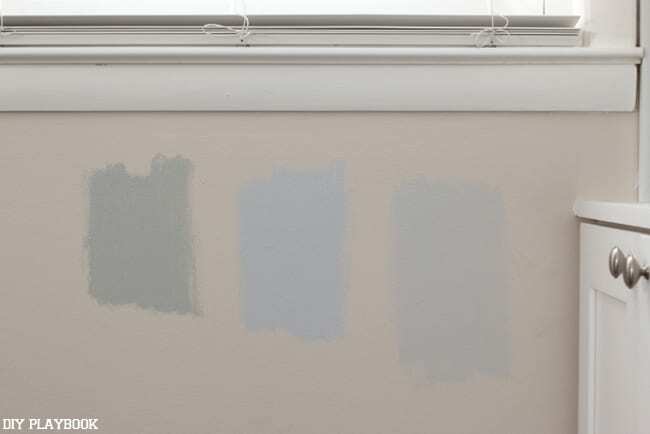 I scoured Pinterest for light gray color options and eventually went to Lowe’s to buy a few of these colors in sample size to test on the wall. 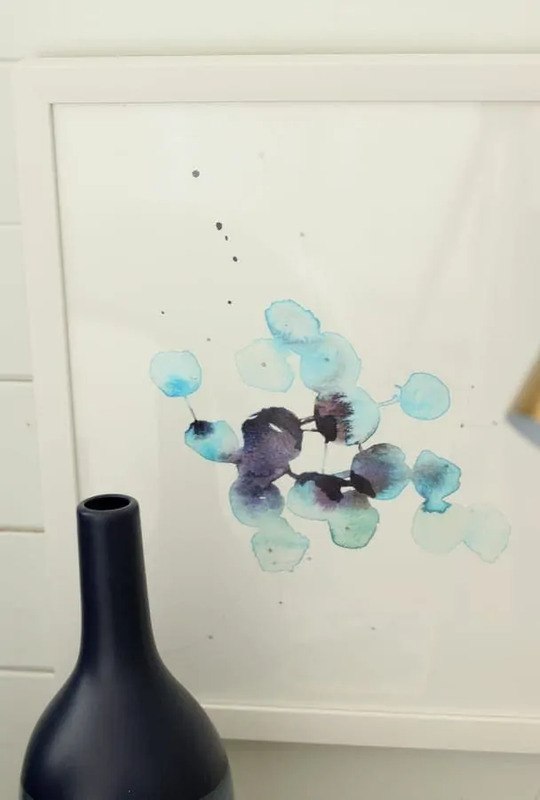 At 99 cents a sample, it was well worth the investment because the colors looked so different on our walls (I would highly recommend this step if you’re undecided on a color). 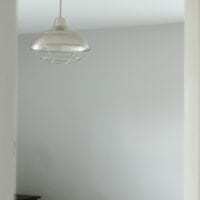 We painted the samples in a few different places around the room to ensure that it would look like we thought it would on the wall — especially next to the woodwork, board and batten, built-ins, etc. 3. Patch the holes from the old anchors & paint: After seeing how one of the grays was too dark for this project, and one was casting far too much blue for my liking, I decided on painting our walls Valspar’s Filtered Shade. It was the truest light gray I found. 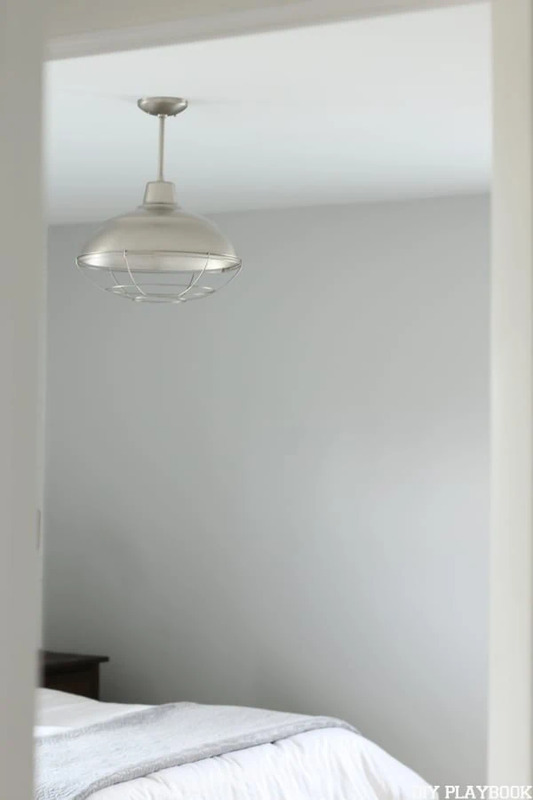 I know it may not be bold or dark enough for some people’s taste (especially next to the white board and batten) but keeping the room light and airy was my biggest priority, so I think this color really works for this situation. 4. 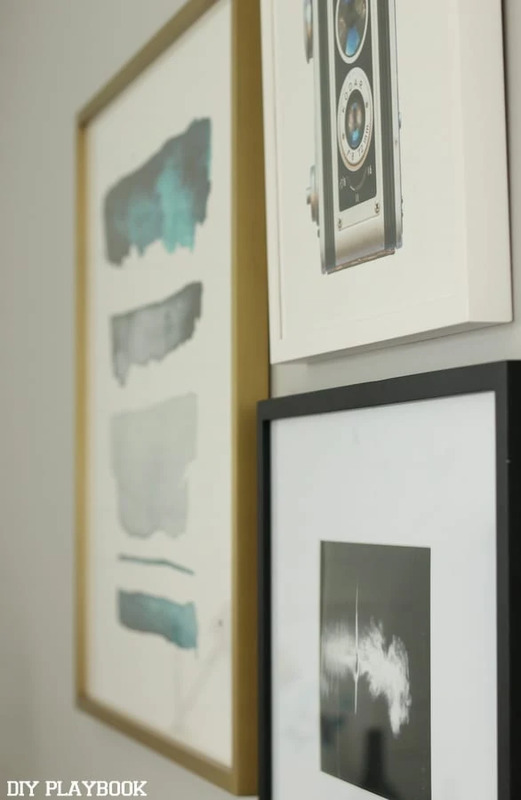 Order new prints/get photography developed: Now… time to update that gallery wall with prints that were A). more our style and B). less busy now that we have a built-in filled with knick-knacks and can appear too busy if it’s clashing with a gallery wall in this small space. I eventually narrowed my search down by creating a “favorite” list on the website (super easy and convenient to do). Then I narrowed my favorites list down even more to just a few that really worked well together and captured the style I was going for. 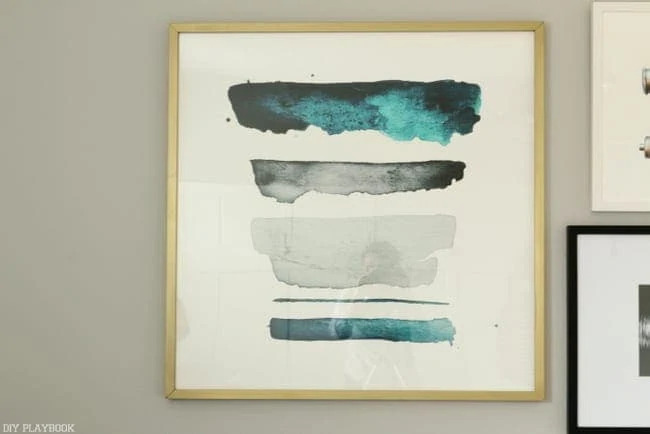 The cool thing about thing about Minted is that you could buy just the print (most economical choice) or buy the print framed (super convenient choice) while also choosing exactly what frame you want (there are about 10 options to choose from). I splurged on the gold sleek frame for this over-sized print because I really didn’t think I could find a frame to fit it perfectly. Plus, I was obsessed with the color of this gold frame and the convenience of getting it done all in one spot. Sometimes the extra money is worth not having to run around and search for a less expensive frame. 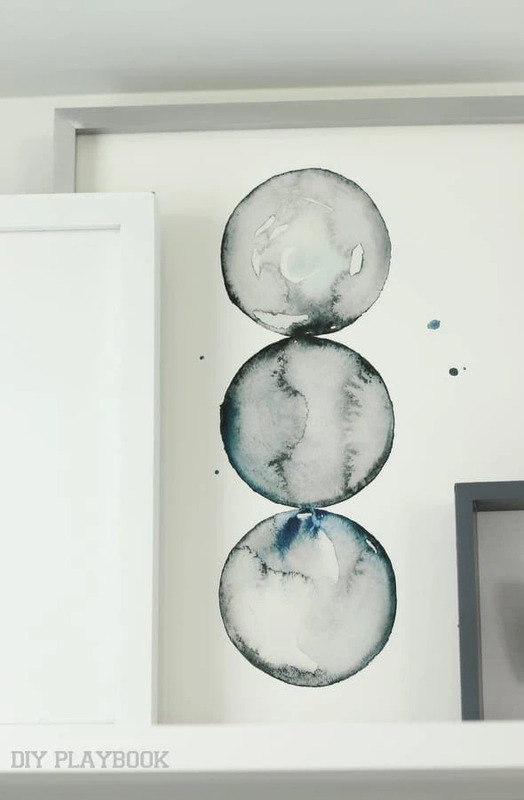 Side note: If you think narrowing down the art on Minted is hard, wait until you see their fabric/home decor section!! Holy moley… so many gorgeous options. I snagged this pillow (great quality) and literally could have bought about 30 other things. 5. Hang new prints: I played around with the grouping of the prints (and even contemplated hanging just the one print alone) but ultimately decided on this set up. It was bold yet simple and had meaningful touches (ie. the vintage camera because some of our favorite days are filled with road trips, coffee and photography.) Then I picked up the black frame from HomeGoods for $16 and filled it with a page out of a book we had around the house (aka FREE). 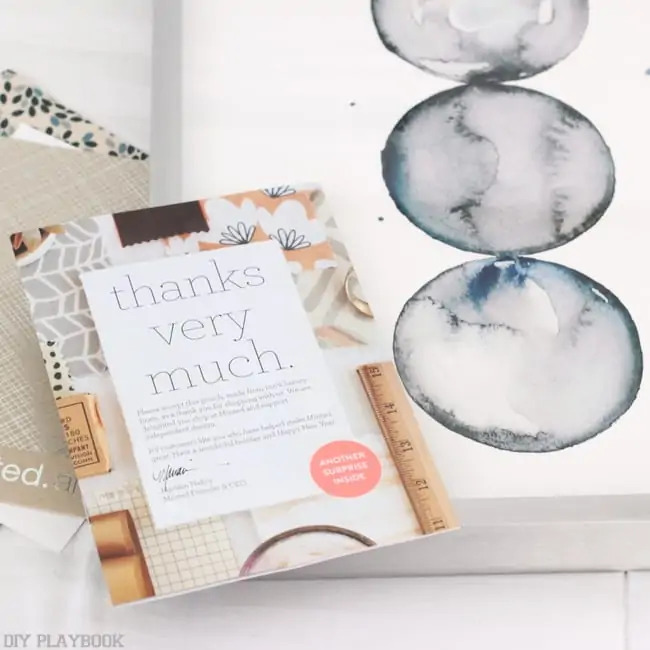 I’m loving the new look and am head-over-heels in love with the watercolor inspired print. I don’t know why, but I just feel like it speaks to me… and will hopefully go well with our navy headboard and eventual pops of gold throughout the room. Plus, I love that if we ever move (no plans, just saying) this print can pretty much be hung in any space so I don’t feel as bad splurging. 6. 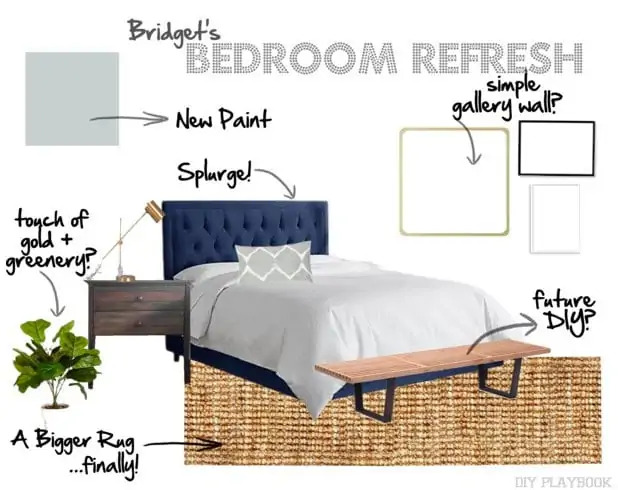 Update the bedroom to-do list: So now that the paint is (barely) dry and the gallery wall is updated, we can check off some serious items on the bedroom to-do list, which is probably my favorite part of any project. But right after I made those checks, I realized we still have quite a bit of work ahead of us…. 7. Totally stress (!!) yet feel so excited at the same time: And that’s when I started to stress. The stress is totally myself putting deadlines on a project that doesn’t really NEED deadlines. 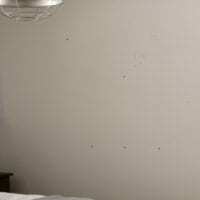 I just want our room to be somewhat finished so that we can go back to relaxing in the space, rather than laying in bed and looking around at everything that still needs to be done. <– total Type A move, I know. 15% Add (this bed and this rug) in this space — super excited to take the plunge on both of these after waiting 3 years to finally go for it. 15% DIY a bench at the foot of the bed — this is not on the calendar anytime soon. Like I mentioned on Monday, I’m anticipating this to be a summer DIY project. And a bench at the foot of the bed is not essential to have in the room for it to function on a day-to-day basis. 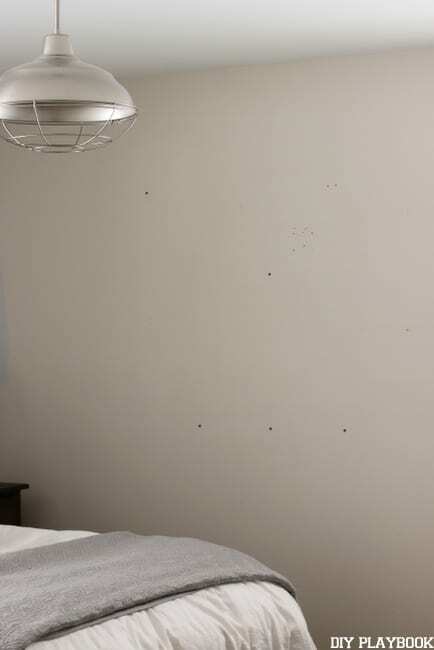 5% Find something to hang above the headboard eventually — Once I get the headboard in place I think I’ll have a better idea of what can go above the bed. 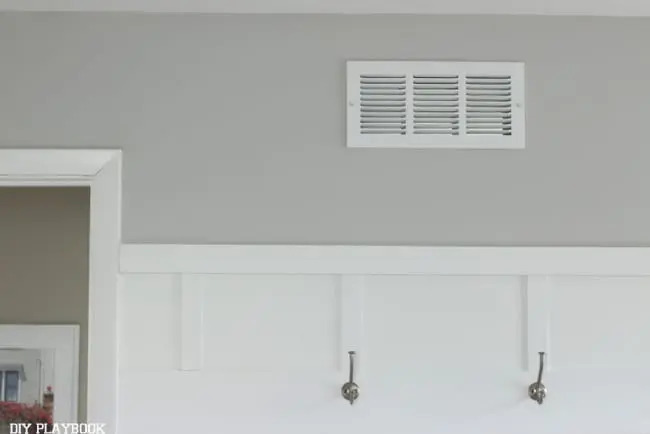 I’ve been keeping my eyes peeled in the blogosphere, Pinterest and Instagram to see what people even put above a headboard. Thoughts? 10% Accessorizing (maybe add an indoor plant, rework accessories that I have, finally organize the inside of the built-ins, etc.) — This is an ongoing process but I’m waiting until the look comes together a bit more completely.